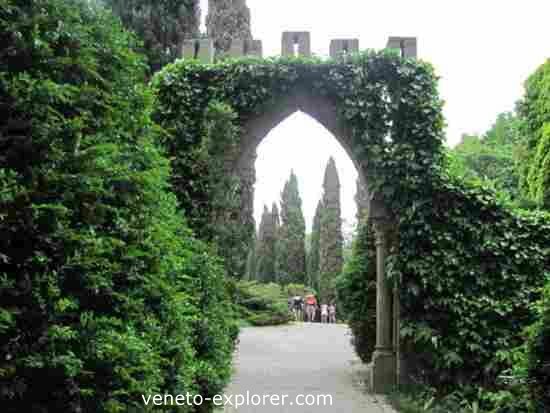 If you are going to spend your vacations in Veneto, Italy, in the breathtakingly beautiful Lake of Garda and surrounding, or in the town of Verona, you might want to consider a day trip to the nearby Parco Sigurtà, located in the small medieval town of Valeggio su Mincio. This scenic park is rated among the five most beautiful gardens in the world that even Prince Charles described it as a world’s unique wonder. 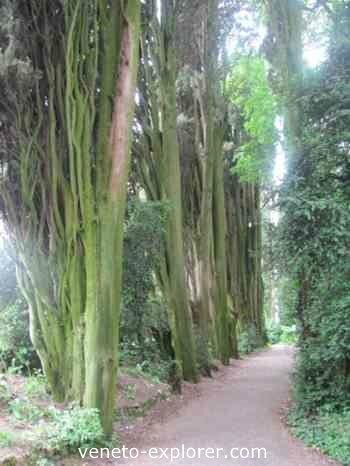 It is dotted by flowers, hedges, many types of centuries old trees, among them a large number of standing Mediterranean cypresses, then olive trees, oaks, maples, box trees, palms, you name it! The huge garden boasts a centuries-old history: back in 1407 it served as an agricultural area; with the time a big part of that walled factory farm turned into a beautiful landscaped garden, and in the 1600s the wealthy owners and their guests used to enjoy their time walking along its numerous panoramic trails. The 1600s magnificent villa Maffei borders the garden: in 1859 it played host even to Napoleon Bonaparte. The villa is not open to visitors, but at one point you can catch sight of its facade across the park’s fence.. but don't sweat it, after all you'll be spoilt for choice in case you want to visit an historic villa during your holiday in Veneto! 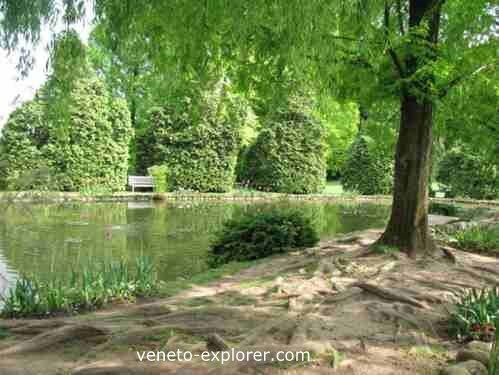 So be ready to spend a day of your vacations in Veneto feasting your eyes on the lush magnificent park and its incredibly green lawn, its centuries old trees, its ponds and lakes, going along part of its 20km/12mi alleys and paths that wind around its 60ha/148ac. 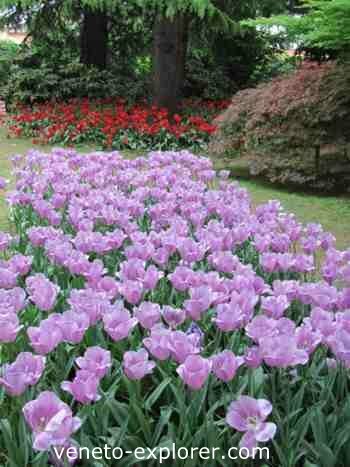 There are five different ways you can visit the garden. My tips? Of course it depends on how much time you have available for your vacations in Veneto, on your physical condition, and on how much you like walking! However, if you don’t have any particular issue keeping you from walking, I would recommend that you go and discover the park by foot. It may take 3 or 4 hours, but it is worthwhile, beside being healthier. Why that? Because you’ll be able to explore the park at your pace, walking upon narrow trails inside the small woods dotting the park, trails that can be traveled only by foot. This way you’ll have the chance to admire secret corners impossible to spot otherwise, or to walk upon the green lawn, even taking a rest laying upon the alluring turf if you wish. As a second option I would recommend you go around by bycicle, another wonderful means of transportation which combines workout with independence. by foot: the visit lasts as much as you want, you can walk everywhere and it’s free! beyond the entrance ticket I mean..
by bycicle: the visit lasts as much as you want too. You can either bring your own bike or rent one at the entrance. Riding a bycicle is a great option as well, however you’ll have to leave the bike for a while and continue forward by foot whenever you want to explore some narrower paths or walk upon the lawn. Adults and children: €3,00 per hour. hop into an electric shuttle with a professional guide who will explain characteristics and history of the park. Only a maximun of 10 people are allowed on board. The trip by shuttle lasts about 1 hour. Children below 1mt/3.28ft in height: free. the golf-cart: every vehicle is equipped with a GPS system to guide you across the garden. €18,00 per hours on Sundays, holidays and August. The train journey lasts about 35 minutes. Free for children below 1mt/3.28ft in height. Free for the disabled with certification. 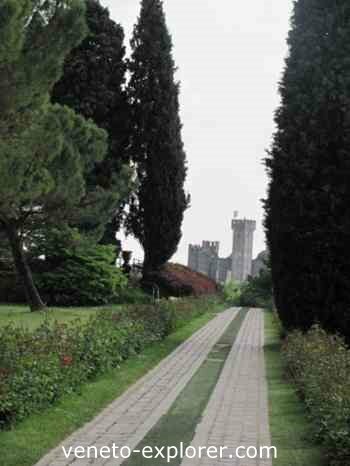 In the Giardino Sigurtà instead, all you have to do is take a deep breath, relax and let the beauty and smell of nature pervade yourself. 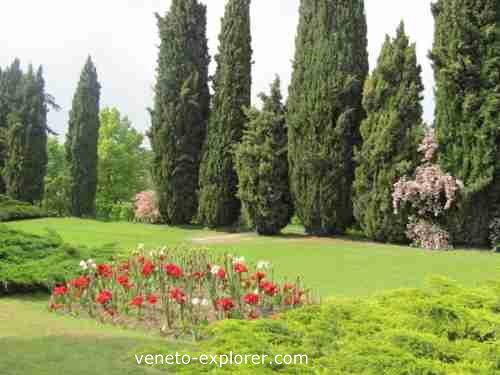 What you’ll see depends partly on the time of the year your vacations in Veneto will take place: if you will be traveling in spring you’ll see a lot of blossom trees, some flowers like tulips, and so on. If you go in autumn, you’ll be stunned by a blaze of color. It’s your choice! Aquatic gardens, with aquatic plants and gold fishes swimming inside. Small lakes surrounded by trees and flowers. A didactic farm with animals like donkeys, goats, turkeys and such. A fenced park with deers inside approaching fearless. An old eremo - hermitage - overlooked by a hill covered with olive groves. A romantic viewpoint - the Romeo and Juliet belvedere , overlooking part of the park and the valley below. Near the belvedere – on the ground - lies a sundial. a romantic small castle, immersed in a centuries old wood embellished with ornamental ponds populated with (really) huge gold fishes. And much much more. It is no possible to describe it all, the park is spectacular and no word can picture it! I just can recommend over and over that you go and see it if you are spending your vacations in Veneto in the area. From March 6th to November 6th: 9am-6pm. Exit by 7pm. In March, October, November: 9am-5pm. Exit by 6pm. Address: via Cavour 1, Valeggio sul Mincio (province of Verona). Take the Autostrada A4, exit in Peschiera del Garda and follow the signs to Valeggio sul Mincio and Parco/Giardino Sigurtà.